Wrist pain is a common clinical presentation and the specific diagnosis is often challenging to obtain with clinical evaluation and radiography alone. If the patient’s initial radiographs are noncontributory to the diagnosis, further imaging is often necessary. MRI utilization has progressively increased due to a variety of factors, including more athletic pursuits in children that may cause wrist injury, widespread availability of MRI, and improved diagnostic capabilities of wrist MRI. Therefore, MRI is a key diagnostic modality that can heavily influence treatment decisions, making it essential that radiologists effectively diagnose common wrist disorders. 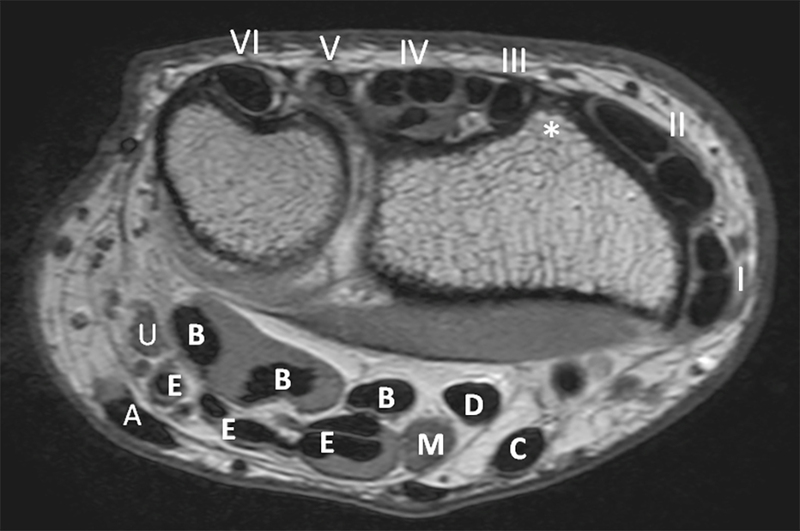 This review article focuses on MRI assessment of the wrist, including ligamentous injuries, carpal fractures, and various tendon pathologies, as well as patterns of advanced collapse and avascular necrosis affecting the wrist. Scapholunate Ligament Injury—The SLL is horseshoe shaped with 3 components: the volar, dorsal and proximal zones. The dorsal component is approximately 3 mm thick and is associated with the joint capsule. The dorsal component is the most critical in preserving the relationship between the proximal poles of the scaphoid and the lunate.4 The volar component is ligamentous and thinner than the dorsal component. The proximal component is the weakest and most susceptible to degenerative perforation. Volar Extrinsic Ligaments—There are 3 major volar extrinsic ligaments: the radioscaphocapitate (RSC), radiolunotriquetral (RLT), and short radiolunate (SRL) ligaments (Fig- ure 3). The RSC arises from the radial styloid process volar surface, supports the scaphoid waist, and inserts to the capitate. The RSC supports scaphoid stability acting as a “seat belt” at the scaphoid waist.2 The RLT arises from the radial styloid process volar rim, passes volar to the proximal scaphoid pole, attaches to the volar surface of the lunate, and inserts onto the triquetrum.2 The RLT is clinically important for load transference and preventing ulnar translation of the carpus.2 The SRL arises from the volar-ulnar aspect of the radius and attaches to the volar aspect of the lunate. Therefore, both RLT and SRL strongly anchor the lunate to the radius. On coronal images, the normal disc proper shows asymmetric bowtie-like low signal intensity, whereas the triangular ligament shows a striated pattern of increased internal signal (Figure 5).15 On axial images, the volar and dorsal radioulnar ligaments are well recognized as hypointense band-like structures (Figure 6). The ulnolunate and ulnotriquetral ligaments show homogeneous low-signal intensity (Figure 7). Traumatic tears occur far less frequently than degenerative tears. The most common mechanism of traumatic TFCC injury is a fall on an outstretched hand. TFCC tears usually present clinically as ulnar-sided wrist pain and/or distal radioulnar joint instability. Class I/traumatic TFCC tears are subclassified according to injury location. Conservative treatments are generally recommended; when conservative management is unsuccessful, several surgical options can be considered. The surgical treatments can be based on the TFCC lesion location. Class IA tear is at the central/paracentral region of the disc proper, which is the most common traumatic subtype of TFCC tears (Figure 8). Since the avascular central articular disc has limited healing capacity, debridement is usually performed for pain relief.20 Class 1B tear is the avulsion of the triangular ligament with or without an ulnar styloid fracture (Figure 9). The instability of the distal radioulnar joint is most remarkable in Class IB injuries. Class IC tear is avulsion of the ulnolunate or ulnotriquetral ligaments, which can result in ulnocarpal instability. For Class IB and IC injuries, surgical repair may be indicated.20 A Class ID tear involves either an avulsion tear of the TFCC (Figure 8) or an avulsion fracture at the sigmoid notch of the radius. When the avulsion fracture exists, a direct repair leads to better outcomes.20 For a Class ID tear without avulsion fracture, various surgical repairs have been reported and ulnar shortening osteotomy may relieve the axial load on the TFCC. A cadaveric study reported that TFCC degeneration begins in the third decade, and subsequent perforations increase with age.21 Similarly, MRI findings of degenerative TFCC lesions were seen with higher frequency in patients older than 50.22 Traumatic and degenerative abnormalities are difficult to distinguish between and can coexist as age increases. Up to 40% of scaphoid fractures are missed at initial presentation, and follow-up MRI of the wrist is becoming more common. A scaphoid fracture segment with hypointense T1- and T2-signal is concerning for decreased vascularity. While these findings alone are a poor predictor of impending osteonecrosis/nonunion, they should raise suspicion for potential setbacks in healing (Figure 12).27 As osteonecrosis develops, the scaphoid will exhibit fragmentation and collapse. Treatment of scaphoid fractures is typically achieved conservatively with immobilization. Stable, nondisplaced fractures involving the mid/distal poles achieve a union rate of 90% with casting alone.27 Surgery is commonly reserved for unstable or displaced fractures, proximal pole fractures, or when nonunion/osteonecrosis occurs. The triquetrum is the second-most commonly fractured carpal bone, accounting for 18.3% of carpal fractures.28 They typically involve the dorsal cortex and are most frequently diagnosed on lateral radiographs of the wrist. Triquetral fractures are radiographically occult in up to 20% of cases.28,29 On MRI, the most sensitive finding is bone marrow edema, which may even obscure the fracture line. Most commonly, the small fracture fragment is visualized within the dorsal soft tissues and follows the osseous signal on all sequences; however, diffuse soft-tissue edema may obscure these fragments. It has been suggested that the dorsal fracture fragment results from a dorsal extrinsic ligament avulsion injury.28 There is often combined ligamentous injury in these patients, which reinforces MRI’s role in acute wrist injuries. Less frequent triquetral fractures involve the body of the triquetrum (typically in the setting of perilunate fracture dislocation) and volar avulsion fractures (ulnotriquetral or lunotriquetral ligament avulsion). MRI demonstrates a T1-hypointense and T2-hyperintense fracture line (Figure 13). Comment should be made on the degree of displacement and signal characteristics of the displaced fragment, as there is increased risk of nonunion when the hook of the hamate is involved. Pathology of the wrist tendons include tendinopathy, tenosynovitis, and partial and complete tears. MRI allows the radiologist to reliably distinguish between these entities. Tendinopathy is a generalized term describing diffuse or focal tendon thickening. This is usually secondary to chronic overuse and presents with T2-hyperintense signal within the tendon substance (Figure 15A). Tenosynovitis presents with a hyperintense fluid-signal within the tendon sheath (Figures 15B, 16). The diameter of the tendon sheath fluid is greater than the tendon diameter. Fluid-like signal that does not surround the tendon is most commonly a normal finding. Usually patients with tenosynovitis or tendinopathy complain of localized tenderness, decreased grip strength, and pain with range of motion. These entities are usually related to repetitive trauma and inflammatory or infectious arthritis. Any wrist tendon may be affected; however, tendons at a point of restriction are most commonly involved (eg, the ECU tendon as it passes over the ulnar groove). They are often successfully treated with conservative therapy. First described in 1895, this condition is a stenosing tenosynovitis affecting the extensor pollicis brevis (EPB) and abductor pollicis longus (APL) tendons of the wrist.30,32,33 This results from chronic overuse and can commonly be seen in women (particularly new mothers), racquet sports, golf, and also recently recognized in frequent texters. Patients present with pain along the radial aspect of the wrist exacerbated by thumb adduction and ulnar deviation of the wrist. There can be localized swelling and tenderness. The Finkelstein test is positive when pain occurs upon passive ulnar deviation while the thumb is adducted. 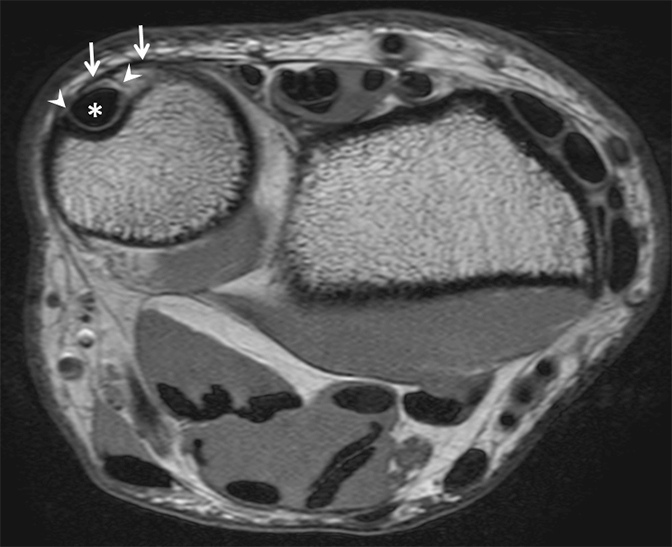 MRI displays EPB and APL tenosynovitis with fluid-like signal within the tendon sheath. Associated tendinopathy varies from localized tendon thickening to an interstitial tear. Peritendinous edema-like signal also often surrounds the first extensor compartment (Figure 18). Treatment begins conservatively with nonsteroidal anti-inflammatory drugs (NSAIDS) and immobilization with a thumb spica brace. Corticosteroid injection into the first dorsal compartment can also yield good results. Surgical decompression is reserved for patients who fail these measures. The ECU has unique anatomical characteristics and courses along the dorsomedial aspect of the forearm through its own fibro-osseous tunnel, in a groove between the ulnar head and the styloid process.10,14,34 This tunnel is formed by the distal ulna and a band of connective tissue known as the ECU subsheath, which stabilizes the ECU as it courses over the distal ulna (Figure 19). The combination of the subsheath and extensor retinaculum prevent subluxation and friction of the ECU tendon. These entities occur from repetitive stress causing synovial inflammation and are commonly seen in athletes, particularly rowers and racquet sport players. Typical presentation includes point tenderness and swelling at the dorsal/ulnar aspect of the wrist. Progression usually begins with tenosynovitis and circumferential hyperintense T2-signal on MRI. 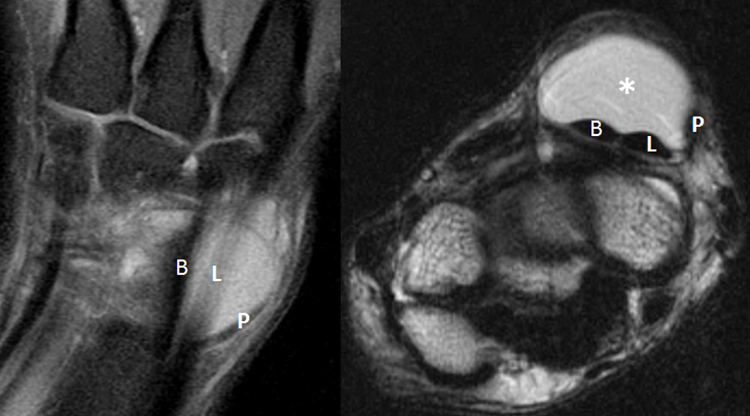 Continued stress leads to tendinopathy and ultimately tendon tear.9 A pitfall on MRI is the “pseudolesion,” which is when the tendon has centrally increased T1- and T2-signal on axial images at the level of the distal radioulnar joint (DRUJ). This is secondary to intrasubstance mucoid degeneration or magic angle effect.1,35 Nonfocal increased signal and tendon thickening distinguish true tendinosis from a pseudolesion. Nonsurgical conservative treatment is often successful with splinting of the wrist for 6 to 8 weeks. If this fails, surgical release of the sixth compartment can be performed with tendon debridement and subsheath reconstruction. The ulnar wall of the subsheath can rupture in the setting of trauma or with recurrent stress injuries. This often results in ECU subluxation, with ulnar displacement of the tendon, even if the overlying extensor retinaculum is intact.9,30 The tendon commonly returns to a normal position in pronation. On MRI, the ECU is subluxed with complete tears of the ECU subsheath dorsal attachment. The volar attachment of the ECU subsheath is often lax and there is usually peritendinous edema (Figure 20). These intersection syndromes are commonly treated conservatively with steroid or local anesthetic injection into the second compartment. If this fails, tenosynovectomy and decompression can be performed at the level of intersection. SLAC wrist pattern of osteoarthritis occurs after injury or degenerative attenuation of the SLL. SNAC wrist develops following a scaphoid fracture that progresses to nonunion. There is a traditional 4-stage classification scheme of SLAC and SNAC wrists.39 Stage I displays arthrosis at the radial styloid-distal scaphoid articulation. Stage II involves the proximal radioscaphoid joint in SLAC wrists and the scaphocapitate joint in SNAC wrists. Stage III involves degeneration of the midcarpal joint, and specifically the capitolunate joint (Figure 22). Stage IV involves pancarpal arthrosis with preservation of the radiolunate joint. The pattern of disease follows a progression delineated by the Lichtman classification, staging by lunate morphology and signal characteristics (Figure 23). In stage I, the lunate maintains its normal morphology, but develops a uniform edema-like pattern of diffuse T1-weighted hypointensity and hyperintense signal on fluid-sensitive sequences. Stage II denotes the early sclerotic changes of the lunate with hypointense signal on T1WI and variable signal on fluid-sensitive sequences. Stage II also marks the earliest findings on plain film radiography with increased density of the lunate. Progression to collapse is first demonstrated in stage III with loss of height in the coronal plane and lengthening of the lunate in the sagittal plane. Stage IV is characterized by lunate collapse along with radiocarpal and midcarpal degenerative change. In addition, an adjacent reactive synovitis and joint effusion may be associated.40 If intravenous gadolinium is used during imaging, nonenhancing portions of the lunate are concerning for nonviable fragments, although late revascularization may occur. MRI of the wrist is progressively increasing in utilization, but is often a daunting task for interpreting radiologists. Understanding the complex anatomy of the wrist and more common disease of the ligamentous, osseous, and tendinous structures allows the radiologist to efficiently and accurately evaluate MRI of the wrist with improved diagnostic capabilities. This ultimately leads to more efficient treatment and better patient outcomes. Burns JE, Tanaka T, Ueno T, et al. Pitfalls that may mimic injuries of the triangular fibrocartilage and proximal intrinsic wrist ligaments at MR imaging. Radiographics 2011;31(1):63-78. Ringler MD, Murthy NS. MR Imaging of wrist ligaments. Magn Reson Imaging Clin N Am 2015;23(3):367-391. Tanaka T, Ogino S, Yoshioka H. Ligamentous injuries of the wrist. Semin Musculoskelet Radiol 2008;12(4):359-377. Bateni CP, Bartolotta RJ, Richardson ML, et al. Imaging key wrist ligaments: what the surgeon needs the radiologist to know. Am J Roentgenol 2013;200(5):1089-1095. Hafezi-Nejad N, Carrino JA, Eng J, et al. Scapholunate interosseous ligament tears: diagnostic performance of 1.5 T, 3 T MRI, and MR arthrography—a systematic review and meta-analysis. Acad Radiol 2016;23(9):1091-1103. Elsaftawy A, Jabłecki J, Jurek T, et al. New concept of scapholunate dissociation treatment and novel modification of Brunelli procedure—anatomical study. BMC Musculoskelet Disord 2014;15:172. Magee T. Comparison of 3-T MRI and arthroscopy of intrinsic wrist ligament and TFCC tears. Am J Roentgenol 2009;192(1):80-85. Asaad AM, Andronic A, Newby MP, et al. Diagnostic accuracy of single-compartment magnetic resonance arthrography in detecting common causes of chronic wrist pain. J Hand Surg Eur Vol 2017;42(6):580-585. Watanabe A, Souza F, Vezeridis PS, et al. Ulnar-sided wrist pain. II. Clinical imaging and treatment. Skeletal Radiol 2010;39(9):837-857. Vezeridis PS, Yoshioka H, Han R, et al. Ulnar-sided wrist pain. Part I: anatomy and physical examination. Skeletal Radiol 2010;39(8):733-745. Taneja AK, Bredella MA, Chang CY, et al. Extrinsic wrist ligaments: prevalence of injury by magnetic resonance imaging and association with intrinsic ligament tears. J Comput Assist Tomogr 2013;37(5):783-789. Kirchberger MC, Unglaub F, Mühldorfer-Fodor M, et al. Update TFCC: histology and pathology, classification, examination and diagnostics. Arch Orthop Trauma Surg 2015;135(3):427-437. Cody ME, Nakamura DT, Small KM, et al. MR Imaging of the triangular fibrocartilage complex. Magn Reson Imaging Clin N Am 2015;23(3):393-403.
von Borstel D, Wang M, Small K, et al. 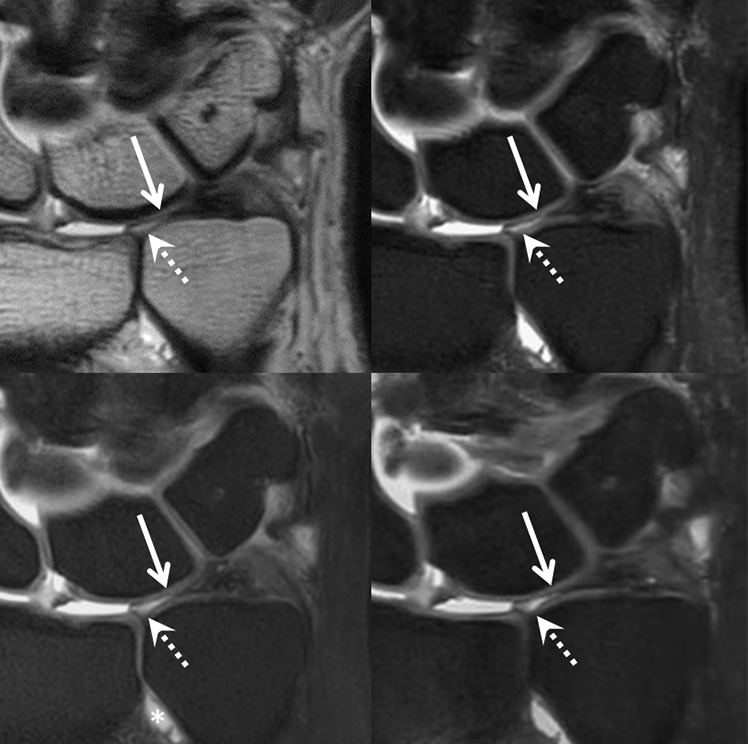 High-resolution 3T MR Imaging of the triangular fibrocartilage complex. Magn Reson Med Sci 2017;16(1): 3-15. Yoshioka H, Burns JE. Magnetic resonance imaging of triangular fibrocartilage. J Magn Reson Imaging 2012;35(4):764-778. Wang ZX, Chen SL, Wang QQ, et al. The performance of magnetic resonance imaging in the detection of triangular fibrocartilage complex injury: a meta-analysis. J Hand Surg Eur Vol 2015;40(5):477-484. Smith TO, Drew B, Toms AP, et al. Diagnostic accuracy of magnetic resonance imaging and magnetic resonance arthrography for triangular fibrocartilaginous complex injury: a systematic review and meta-analysis. J Bone Joint Surg Am 2012;94(9):824. Chang AL, Yu HJ, von Borstel D, et al. Advanced imaging techniques of the wrist. Am J Roentgenol 2017;209(3):497-510. Palmer AK. 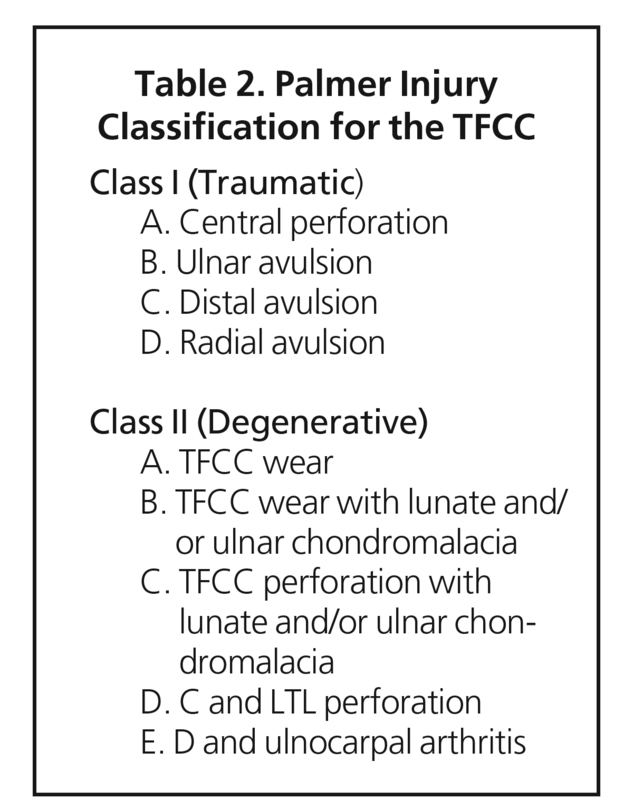 Triangular fibrocartilage complex lesions: a classification. J Hand Surg Am 1989;14(4):594-606. Minami A. Triangular fibrocartilage complex tears. Hand Surg 2015;20(1):1-9. Mikić ZD. Age changes in the triangular fibrocartilage of the wrist joint. J Anat 1978;126(Pt 2):367-384. Nozaki T, Rafijah G, Yang L, et al. 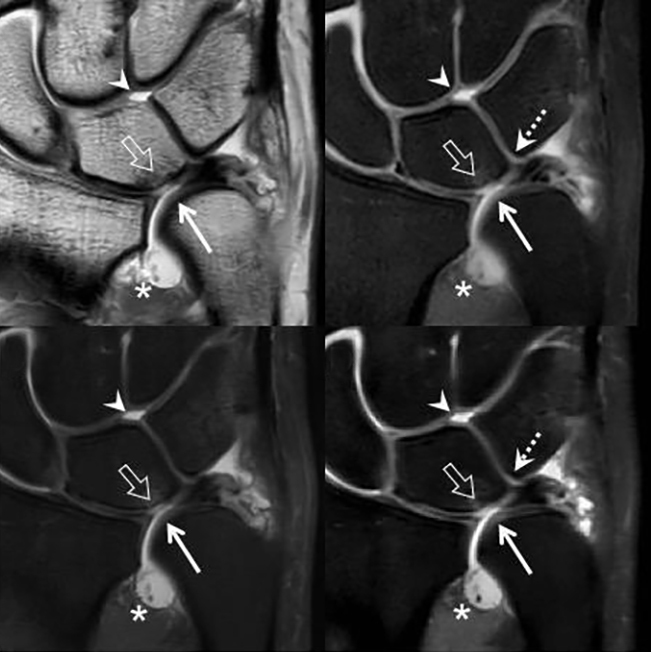 High-resolution 3 T MRI of traumatic and degenerative triangular fibrocartilage complex (TFCC) abnormalities using Palmer and Outerbridge classifications. Clin Radiol 2017;72(10):904.e1-e904.e10. Ootes D, Lambers KT, Ring DC. The epidemiology of upper extremity injuries presenting to the emergency department in the United States. Hand 2012;7(1):18-22. Beeres FJP, Rhemrev SJ, den Hollander P, et al. Early magnetic resonance imaging compared with bone scintigraphy in suspected scaphoid fractures. J Bone Joint Surg Br 2008;90(9):1205-1209. Kanavaki A, Draenert C, Ceroni D, et al. Short MRI protocol for excluding traumatic lesions of the scaphoid bone in children. In Vivo 2016;30(4):495-499. Kaewlai R, Avery LL, Asrani AV, et al. Multidetector CT of carpal injuries: anatomy, fractures, and fracture-dislocations. Radiographics 2008;28(6):1771-1784. Dawson JS, Martel AL, Davis TR. Scaphoid blood flow and acute fracture healing. A dynamic MRI study with enhancement with gadolinium. J Bone Joint Surg Br 2001;83(6):809-814. Becce F, Theumann N, Bollmann C, et al. Dorsal fractures of the triquetrum: MRI findings with an emphasis on dorsal carpal ligament injuries. Am J Roentgenol 2013;200(3):608-617. Welling RD, Jacobson JA, Jamadar DA, et al. MDCT and radiography of wrist fractures: radiographic sensitivity and fracture patterns. Am J Roentgenol 2008;190(1):10-16. Plotkin B, Sampath SC, Sampath SC, et al. MR imaging and US of the wrist tendons. Radiographics 2016;36(6):1688-1700. Meraj S, Gyftopoulos S, Nellans K, et al. 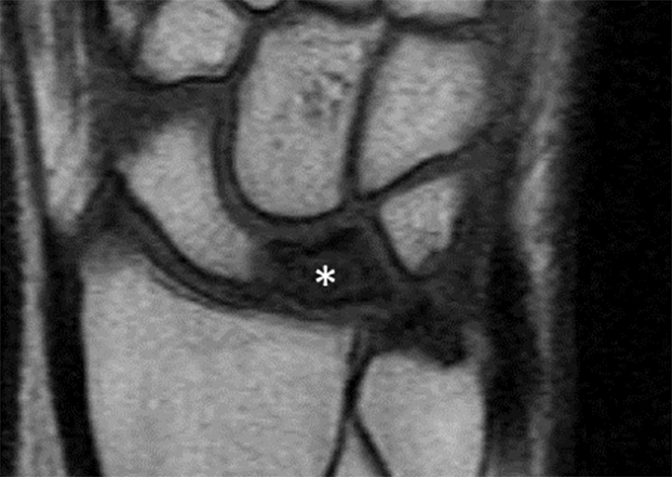 MRI of the extensor tendons of the wrist. Am J Roentgenol 2017;209(5):1093-1102. Lok RLK, Griffith JF, Ng AWH, et al. 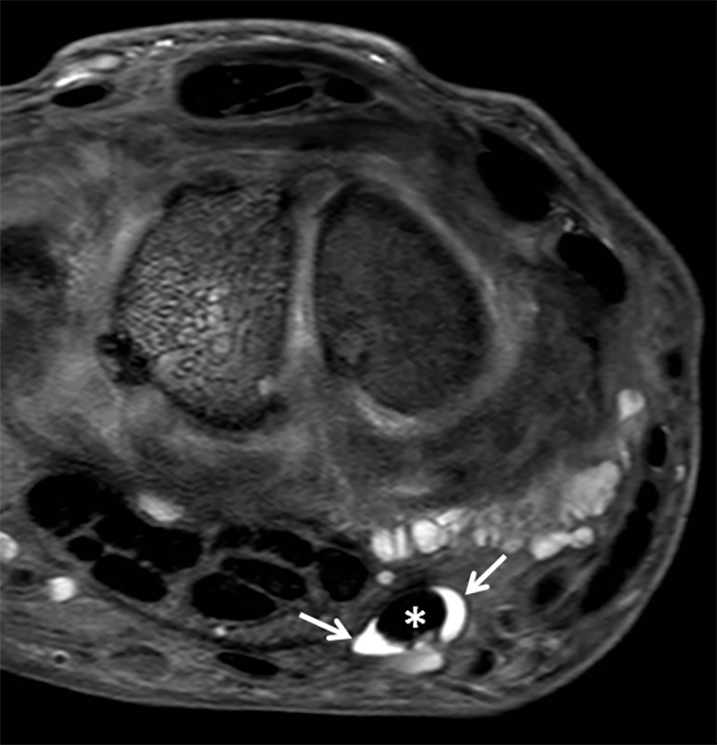 Imaging of radial wrist pain. Part II: pathology. Skeletal Radiol 2014;43(6):725-743. Cockenpot E, Lefebvre G, Demondion X, et al. Imaging of sports-related hand and wrist injuries: sports imaging series. Radiology 2016;279(3):674-692. Henderson CJ, Kobayashi KM. Ulnar-sided wrist pain in the athlete. Orthop Clin North Am 2016;47(4):789-798. Ali S, Cunningham R, Amin M, et al. The extensor carpi ulnaris pseudolesion: evaluation with microCT, histology, and MRI. Skeletal Radiol 2015;44(12):1735-1743.
de Lima JE, Kim H-J, Albertotti F, et al. 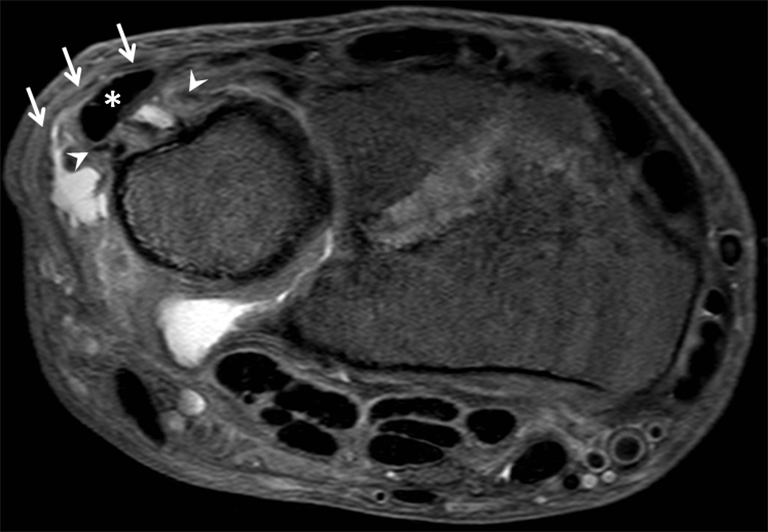 Intersection syndrome: MR imaging with anatomic comparison of the distal forearm. Skeletal Radiol 2004;33(11):627-631. Watson HK, Ballet FL. The SLAC wrist: scapholunate advanced collapse pattern of degenerative arthritis. J Hand Surg Am 1984;9(3): 358-365. Li AE, Lee SK, Rancy SK, et al. Comparison of Magnetic Resonance Imaging and Radiographs for Evaluation of Carpal Osteoarthritis. J Wrist Surg 2017;6(2):120-125. Shah CM, Stern PJ. Scapholunate advanced collapse (SLAC) and scaphoid nonunion advanced collapse (SNAC) wrist arthritis. Curr Rev Musculoskelet Med 2013;6(1):9-17. Arnaiz J, Piedra T, Cerezal L, et al. Imaging of Kienböck disease. Am J Roentgenol 2014;203(1):131-139. Lutsky K, Beredjiklian PK. Kienböck Disease. J Hand Surg Am 2012;37(9):1942-1952.
von Borstel D, Horiuchi S, Strle N, Yoshioka H. MRI of the Wrist. J Am Osteopath Coll Radiol. 2018;7(3):15-27. Donald von Borstel, D.O., Saya Horiuchi, M.D., Nicholas Strle, D.O., Hiroshi Yoshioka, M.D., Ph.D.
Dr. von Borstel and Dr. Strle work with the Department of Radiology, Oklahoma State University Medical Center, Tulsa, OK. Dr. Horiuchi and Dr. Yoshioka work with the Department of Radiological Sciences, University of California, Irvine, Orange, CA.